SALT LAKE CITY, Utah -- Phil X is one busy guitar player. Equally at home live, in the studio or on YouTube, he has played with scores of top-name artists like Kelly Clarkson, Tommy Lee, Avril Lavigne, Daughtry, Chris Cornell, Tommy Lee, Bon Jovi, Alice Cooper and more. Phil X plays in the band The Drills (www.thedrills.com), and his wry humor and no-holds-barred playing style have made him one of the world's most viewed guitarists via his YouTube demos for guitar dealer Fretted Americana. 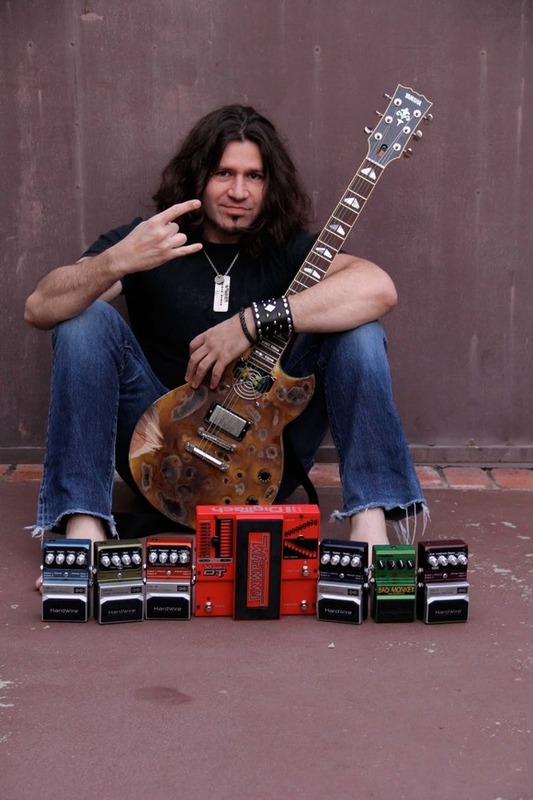 Phil X can use any overdrive pedal he pleases -- and his mainstay is the DigiTech Bad Monkey. "Whenever I need overdrive, my go to is the Bad Monkey," Phil notes. "It simply does everything I want an overdrive to do." "I have also been recently using the HardWire pedals. The CR-7 Stereo Chorus is amazing, the TR-7 Tremolo/Rotary killer and the RV-7 Reverb is astounding -- couldn't be better." "I like DigiTech gear because of the quality, how rugged it is and its affordability," Phil continued. "It's valuable to me to be able to tell young guitar players what gear I use, and know they can actually afford it. I constantly get e-mails from kids around the world telling me how much they love the Bad Monkey, and asking me what settings I use." Underneath Phil Xs affable demeanor is a musician who takes the tools of his trade very seriously. "I have a pretty crazy ear when it comes to effects. I know exactly what I like and don't like. The HardWire pedals blew me away when I first heard them. Sometimes I am looking for a piece of gear to be simple and sometimes I want crazy options. The HardWire gear does both. The pedals are simple, yet give me a ton of variety." "I've also been able to simplify my setup," Phil continued. "With HardWire, I know I can get everything I need with one chorus pedal, one delay pedal and one reverb pedal along with my Bad Monkey, which reduces the amount of gear that I need to have at all times. In the studio, having access to a lot of sounds is like painting with a bunch of colors and textures to make the mood feel right. It's the time to experiment and find unique sounds." "On stage, it's a different story," notes Phil. "There's no time to experiment with effects settings. Everything has to be ready to go. Live, I know I can just hook my DigiTech pedals up and rely on them, freeing me to devote myself fully to my performance. Ultimately, I want my two hands to be what entertains people."